USA Today bestselling author, Linda Watkins currently resides in Sedona, Arizona and, in another life, served as a Senior Clinical Financial Analyst at Stanford University School of Medicine. Born on the east coast, she grew up in a suburb of Detroit. Upon graduation from college (Carnegie Mellon, '70), she moved to the San Francisco Bay Area where she lived and worked for most of her adult life. 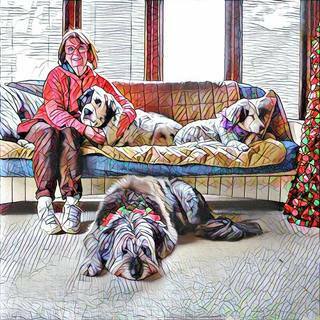 In 2006, she packed her belongings and, along with her 3 rescue dogs, took the plunge and moved to a remote island off the coast of Maine. Return to Mateguas Island, the sequel, was also awarded a 1st Place Award in Contempory Gothic in the 2015 CHANTICLEER BOOK REVIEW PARANORMAL AWARDS and was named 2016 Finalist in Horror by READERS' FAVORITE INTERNATIONAL BOOK AWARD COMPETITION. In 2016, she published the third novel in the Mateguas Island Series, Ghosts of Mateguas. Today, Linda lives in Sedona, AZ and has completed a stand-alone coming-of-age love story, Summer Girl. She has also finished a gothic mystery (Storm Island: A Kate Pomeroy Mystery) which is set to publish in late November 2018 and has a novella included in the #! Bestselling anthology, Love Under Fire, which is available now on preorder on Amazon, Barnes & Noble, Kobo, and iBooks. Serious about dog welfare and rescue, all net proceeds from sales of Mateguas Island Series are donated to Linda's charitable trust, The Raison d'Etre Fund for Dogs, Dedicated to Rescue and Research. Linda is a member of the Horror Writers Association, The Great Lakes Association of Horror Writers, The International Association of Crime Writers, and The Authors Guild. To take a look at her other works, please visit her personal website, http://lindawatkins.biz. For more information about Mateguas Island please visit mateguasisland.com.